Monday, we shared advice for first time cruisers. Some have asked if cruise vacations are worth the investment. From my personal experience, I say, “YES!” Not having to plan the itinerary, decide where to eat, or schedule childcare is priceless. Using these 5 money saving cruise tips, your cruise can be an even better value. Book your cruise in January, February or early March through a travel agent. Cruise lines offer discounts the first part of the year. Travel agents with larger companies offer specials during this time that aren’t available to the general public. Put them both together and get the best value for your dollar! Consider group travel. When you book eight double rooms, one cruise fare goes free. Do you have seven friends who want to cruise? Or do you have a family reunion to plan? Group travel might be the answer. Imagine a family reunion at sea — all rooms, meals and entertainment arranged. Great deal and no stress! Travel during shoulder season. “Shoulder season” means the weeks at the front or back end of the high travel season. Cruise lines offer discounts for sailing the less popular weeks. This article from CruiseCritic explains shoulder season for regions around the world. Pack wisely! Don’t spend money on a new wardrobe for your cruise. Splurge on a new swimsuit if yours is stretched out, but create outfits with clothes you already own. Cruising should be relaxing; start that with your packing! Along with that pack light. The more you carry, the higher your baggage fees if flying to your cruise. Instead pack light and save some room for souvenirs to take home. 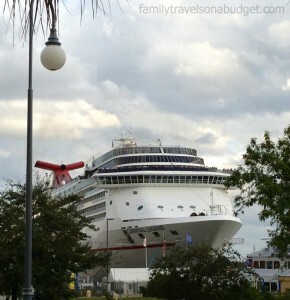 Use these 5 money saving cruise tips vacations to experience a great cruise vacation on a budget! Thanks again, to Holly Woodard at CruiseOne for helping with this post. I’m thankful to know travel professionals who are generous with their time and knowledge! If you have a great cruise tip to save money, please share it with us. Join the conversation here or at our Facebook Page. Do you find these posts helpful? Sign up for posts by email and get each post directly to your inbox. We do not share our email list or send spam. I promise! In the next couple months, we will be adding a newsletter with special deals and insider info not available on the blog! What are you waiting for? Sign up here! Thank you so much to posting your interview with Holly. Between your tips and her help, I think Mark and I are going to have a great time on a cruise! Thanks for the post. We are considering a cruise with friends at Thanksgiving. For a family of four (14 and 16 year old) do you recommend two cabins? I am not familiar with “Double room”? You’re welcome. I hope you get to cruise one day. It’s so relaxing!